H 3545 - Casement Lock Keeper, Aluminum, Universal, Adjustable, 1 per pkg. H 3574 - Casement Lock Keeper, Stamped Steel, Gold Irridite Finish, 1 per pkg. 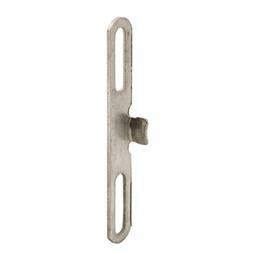 H 3888 - Casement Lock Keeper, Stainless Steel, Reversible, Adjustable, 1 per pkg.